At the official launch party held at Gold Hill Museum on 28 March, over forty members and friends of The Shaftesbury & District Historical Society were quick to snap up signed copies of Roger Guttridge’s latest book. 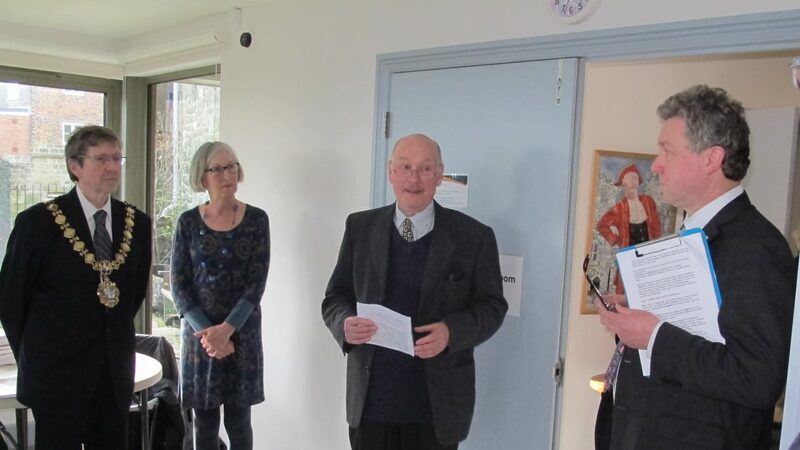 In the presence of the Mayor of Shaftesbury and Mrs Lewer, and introduced by S&DHS Librarian/Archivist Ray Simpson (centre), Roger (right) was keen to acknowledge the importance of historic photographs from Gold Hill Museum’s Collection and the indispensable help given by Trustees Ray and Claire Ryley. Also featured in Shaftesbury Through Time are twenty vintage postcards loaned by Barry Cuff. The book juxtaposes Then and Now photographs, with explanatory text. While seeking the same viewpoints as earlier photographers Roger was frequently frustrated by lines of parked cars and much taller trees and shrubs. Shaftesbury Through Time is available in the Museum shop at the discounted price of £12.50 and each sale benefits the funds of The S&DHS, a registered charity.